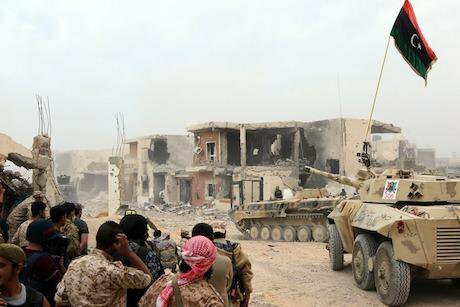 Members of the forces loyal to Libya's Government of National Accord (GNA) take military operations in the coastal city of Sirte during clashes with the ISIS. November 2016. Xinhua SIPA USA/PA Images. All rights reserved.The advent of 2017 witnessed the disintegration of the internationally touted Libyan Political Agreement (LPA), little more than a year after it was signed in December 2015. Within the LPA itself were the elements of its failure. Some are of substance, such as the composition of the presidency council that represents the executive power and is composed of nine members, with a consensus of six required to reach decisions. Others are of a procedural nature, most notably the complexities regarding the LPA entry into force. For the last year the Libyan House of Representatives (HoR) has failed to obtain the quorum legally required to adopt the LPA as a constitutional amendment. It is this vital procedure that would inject life into the LPA and render it applicable within Libyan domestic legislation. However, on Monday 2 January, the resignation of Presidential Council Deputy Prime Minister Mr. Musa Al Koni, definitively compromised the LPA. Al Koni, who represented both the Libyan southern region, Fezzan, and the Libyan Tuareg minority, declared his resignation in an emotional televised press conference. Al Koni cited failure, non-coherence between presidential council members, and the council’s inability to govern as reasons for his resignation. He even took the unusual step of apologizing to the Libyan people, the first apology ever offered by a Libyan politician. Al Koni’s resignation not only exacerbated the problems that swirl around the LPA and further complicated its application, it is the straw that broke the camel’s back. The backbone of the LPA is the presidential council. However, the requirement that presidency council decisions be derived from unanimous agreement by six members handicapped the council and sapped its power. Rivalries, contradictory decisions and statements, lack of coordination between members, and temporary boycotting of the council by two members showed its failure from the beginning. If the presidential council had proven functional and taken the lead to improve people’s daily lives – addressing power cuts, the lack of liquidity, the high price of goods, and other survival issues – additional problematic issues within the LPA would have been mitigated and resolved with time. However, when the presidential council is hamstrung by its composition and the unanimity requirement proves to be a key stumbling block, a white flag should be raised. As a result of the terms of the LPA itself, the resignation of Al Koni makes it impossible to execute the agreement. The mechanism delineated in Article 5 of the LPA to replace a deputy prime minister in the event of resignation requires consensus between the HoR and the State Council (SC), the SC being an authority created by the LPA to include members of the previous remnant Libyan parliament known as the General National Congress (GNC). The HoR has been unable to fully adopt the LPA and initiate the necessary legal procedures to amend the constitutional declaration and ratify the LPA in a constitutional amendment. The SC was founded in violation of the terms of the LPA and therefore cannot derive legitimacy through the LPA. Consequently, it is also contestable by other GNC members. Please note, although Article 10 of the LPA in the additional provisions section also addresses deputy prime minister vacancy, the mechanism provided in Article 5, mentioned above, prevails. This means that the replacement for a deputy prime minister should be selected from the same background and/or origin as the original minister. This means that Al Koni’s replacement in this case should be from the Fezzan region and be of Amazigh origin. Article 5 is the relevant and pertinent article and consensus of both the HoR and SC is required plus HoR endorsement by vote. Furthermore, given that it is impossible to replace Al Koni in accordance with the LPA, the presidential council cannot function, as its decisions require unanimity that can only be reached by the vote of six members (the prime minister and his five deputies). The resignation of Al Koni means that the presidential council is legally dysfunctional and unable to execute its obligation in accordance with the LPA. This paralysis renders the LPA itself dissolved. In the eyes of Libyan legislation, the LPA is viewed as a “contract” since it was not ratified and elevated to a constitutional amendment. According to the general rules on the theory of contracts, a contract whereby its obligations are impossible to perform is dissolved. This is reflected in Article 161 of the Libyan civil code. The Libyan people’s daily basic needs are not being met. Exposure to the extreme dangers of kidnapping and organized crime, the continued presence of ISIS and other extremist groups, militia street fighting, and illegal trafficking of migrants have become the norm in Libya. Bringing an end to the anarchy and lawlessness cannot wait for the six members of the presidential council in their peculiar, forced marriage to find a way to reconcile and cohabitate. If the LPA is not quickly and substantially amended to allow a new executable agreement to be reached, the end of the LPA will have been written from within its own chapters.